Knowing is not enough, we must apply. Willing is not enough, we must do. One of the greatest lessons I learned from my travels abroad is that to workout is a luxury. As my guide in Sri Lanka said, "The rich people do exercise and yoga, everyone else just uses their body to live and work." 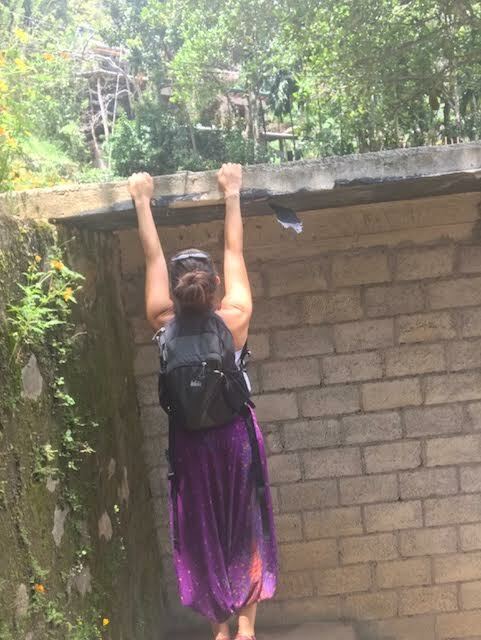 In India and Sri Lanka I saw people climbing trees, squatting to simply rest, carrying bricks on their heads, and digging the foundation for a house with nothing more than a plastic bucket. Their backs were strong and they moved with ease. Mainly because they have been "moving like a human" their whole entire lives. In western culture we have adopted the habit of sitting in chairs often times in front of a computer screen or sitting in a car for hours per week. Sitting in chairs alone impairs hip mobility, leads to rounded shoulders in a slouched over position, forward head posture placing pressure on the cervical spine, compresses the spinal vertebrae, and decreases neurological drive to the abdominals, glutes, and legs (strong glutes and legs are essential for back health). Sometimes people think they need a certain amount of time or a facility to get a workout in. This is not always the case. High quality movement and mobility is a prerequisite for any workout you plan to do whether it's lifting weights, running, or even yoga so start there. The cool thing is you can do it anywhere! Everyday think in terms of movement patterns: squat, hang, hinge, push, pull, rotate. You most likely do many of these movements everyday anyways. What I am suggesting is to bring more awareness to HOW you are doing them and do them more often. We can sit in a chair with awareness and use our core muscles and strengthen the back or get engrossed with emails, projects, etc get trapped in our heads and lose touch with the body as the shoulders round forward and the neck juts forwards. The key is to train the body and keep connection even as we are mentally engrossed with something else. Spread your feet a bit wider than hip distance apart. Keep weight evenly distributed in your feet. Drop your hips down towards the ground while maintaining the natural curves of your spine. Keep your chest lifted. Try to find length in your lower back by sinking the tailbone towards the ground. Place a rolled up yoga mat or towel under your heels or sit on a yoga block or two. Just doing my laundry in India. Grab a stable bar or overhang with your hands slightly wider than shoulder width apart. Keep your core engaged. Try not to over arch your back or swing. Keep tension throughout your body so your entire body is "active." Depress the scapula by bringing the shoulder blades down your spine creating space between your shoulders and your ears and retract by squeezing the scapula towards each other to lift and open the chest. Choose a low bar or overhang, bend your knees, and let your toes touch the ground for support. Practice depressing and retracting the scapula for 10-20 repetitions and then releasing back to neutral to build stability and strength in your shoulders and also build grip strength. Catching some hang time for spinal traction on my way to explore Ella, Sri Lanka. Find something to hang from and get creative with it. New and novel movement patterns are good for the body and the brain!